The complementary workbook to Nonviolent Communication: A Language of Life, which has sold more than 1,000,000 copies Learning the Nonviolent Communication (NVC) process has often been equated with learning a whole new way of thinking and speaking. The NVC Companion Workbook helps you easily put these powerful, effective skills into practice with chapter-by-chapter study of Marshall Rosenberg's cornerstone text, Nonviolent Communication: A Language of Life. Find a wealth of activities, exercises, and facilitator suggestions to refine and practice this powerful way of communicating. Join the hundreds of thousands worldwide who have improved their relationships and their lives with this simple yet revolutionary process. Included in the new edition is a complete chapter on conflict resolution and mediation. 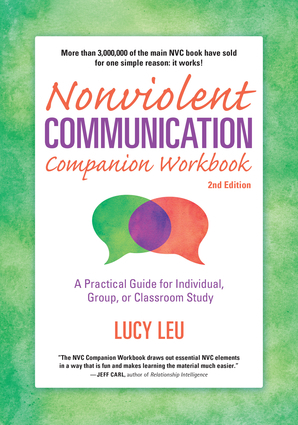 Lucy Leu is the former board president of the Center for Nonviolent Communication (CNVC.org), a Certified NVC Trainer, the editor of the bestselling Nonviolent Communication: A Language of Life, and cocreator of the NVC Toolkit for Facilitators (NVCToolkit.org). She also helped create the Freedom Project, bringing NVC training to prison inmates to support their reintegration into society (FreedomProjectSeattle.org). She lives in Vancouver, British Columbia.